It had been a few years since I visited the deserts of the Eastern Sierras. I decided that I wanted to head back this year to revisit a few great spots and create some new tracks while I was there. I started to coordinate and schedule a trip, sending messages and getting people on board. Then winter came and threw a few curveballs at me. The first attempt at a trip was unfortunately following the week of weather that closed pretty much every major pass and road in and around the route I chose. I checked my usual weather reports early in the week. Turns out the third time was the charm. The weekend weather was looking better than it had in months, the trip was on! I planned to leave on Thursday, taking my time on the way over the Sierras and down to Big Pine. 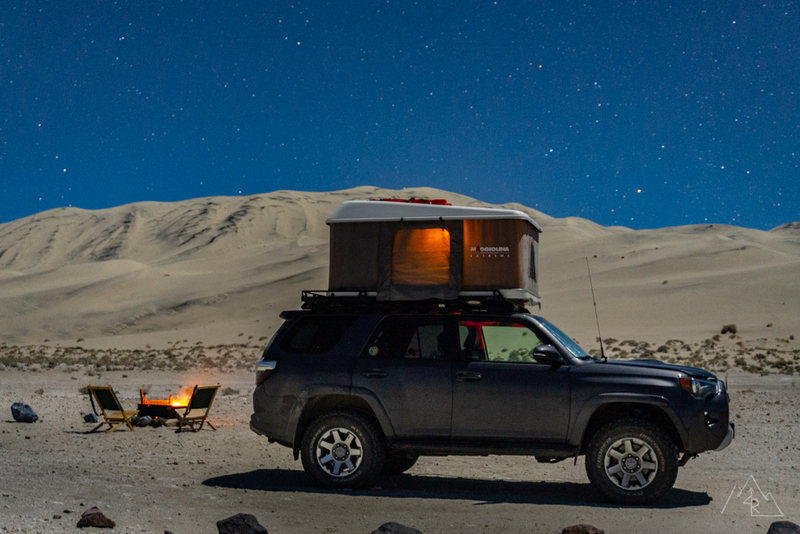 Packing the 4Runner, getting all of the camping gear ready, heading out early in the morning. I had missed this routine. Soon enough, I was overlooking the green rolling hills of the Central Valley as I made my way towards the foot of the Sierras. The Sierras have had an incredible amount of snow this winter. #februBURIED has been on pretty much every Sierra/Tahoe ski resort social media page and once I hit the snow line, I understood why. The road sides were taller than the 4Runner near the summit, and in some places much taller. As I dropped into Nevada, I couldn’t help but think that the camping season in higher elevations will be very short this summer. It’s an easy tradeoff however knowing that lakes will be full and rivers will be flowing all summer long. There will be plenty of other places to sit around a fire later on in the season. I love US-395. It has to be one of the most picturesque roads to drive in California, and for that reason I took the route that brought me all the way down 395 from Gardnerville, NV. My plan for the day was to head S-395 and stop in at a few favorite places along the way. These long, wandering days when all you have to do is be somewhere at the end of it revive my sense of adventure and allow for me to disconnect. I created a mini-brew tour along my route, starting at June Lake Brewing, then Mammoth Brewing and ending at Mountain Rambler Brewing in Bishop. Overall, a great way to spend a day in the mountains. My friend, a past co-worker/boss/teacher, was coming from the Central Coast to join me on this trip along with his daughter who decided to tag along last minute. 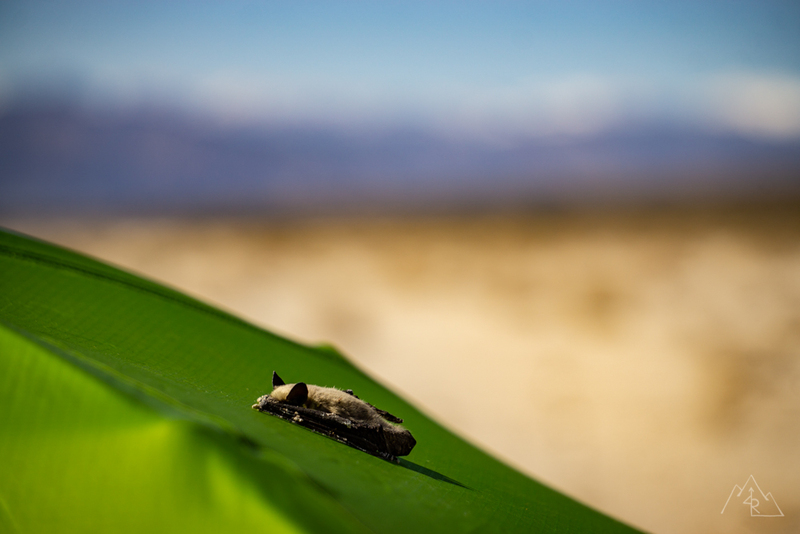 He wasn’t able to leave until later in the day, but we planned to meet at a BLM campsite along the 395 corridor south of Big Pine in the evening. I timed my afternoon with being there around the same time as him, just in time to set up the tent and call it a night. We all had a long (but fun) day getting out there but were eager to head out in the morning. Morning came around, and after a quick breakdown, breakfast and clean-up in camp we drove north to Big Pine, our starting point for the weekend. We fueled up, I topped off the spare fuel pack, and I was able to score 3 morning’s worth of donuts from a local shop. If the trip fell apart, at least there would be donuts. We drove east out of Big Pine to towards Eureka dunes. 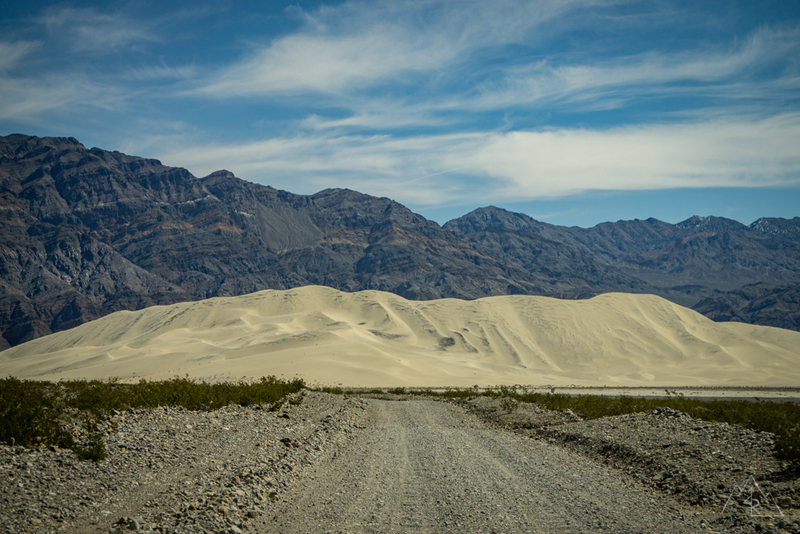 I have been there before, but I wanted to take the main road in to the dunes this time to see what it was like, and to check out the beginning of North Pass into Saline Valley as it was a possible alternate route if Chris’s Tacoma couldn’t make it through Steele Pass. More on that later. Just past the summit, Joshua Trees began to appear in large numbers. Gaia GPS showed that this area long the road was called Joshua Flats. Fitting. Dropping into the Eureka Valley, you get a first glimpse at the dunes in the distance, and a massive view across the rest of the valley. On a map this area doesn’t look like it would be very big, but once you are there the desert shows you its greatest illusion: open space. See, unless you have been to the desert yourself, you wouldn’t know what the experience of being inside of these large valleys looking down at the other end where you are driving towards. They look close, but in reality they are very far away. You’ll realize after a half hour of driving how big that space really is, as you’ll still be looking at your destination in the distance. It’s one of my favorite parts of visiting Death Valley, and I was happy to be back. At the valley floor, the ‘paved’ road turned to the familiar gravel and washboard surface that is common out there. 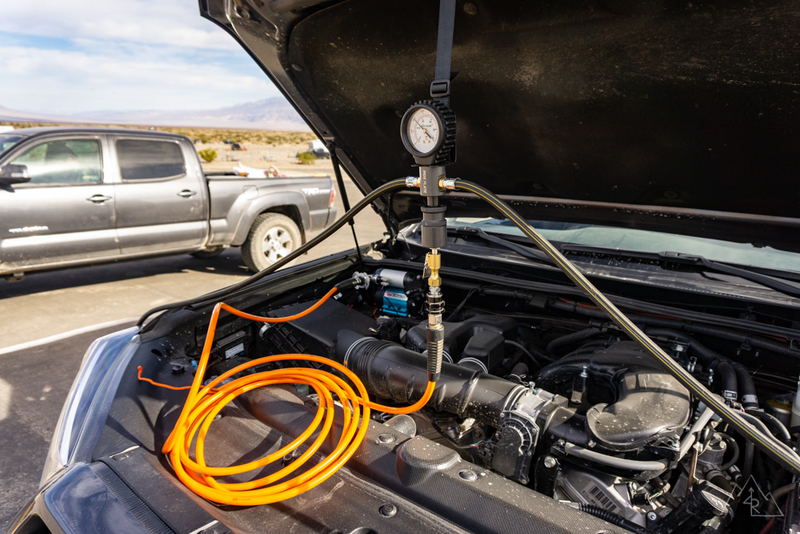 We pulled over to air down which helps keep our teeth in, as well as protect our tires, our vehicles, and the roads themselves. I was using my newly acquired Indeflate (more on that here) to air down, while Chris used my ARB deflator to save some time dropping pressure. We turned back onto the road, heading for the dunes and camp for the night. As you approach the Eureka Dunes, you finally get an idea of just how big they are despite how small they looked earlier. Remember that desert illusion I mentioned earlier. Perfect example. The Eureka Dry Camp is just fancy enough to be called a campsite, but is bear bones enough to make you feel like you’re remote camping. You get a pit toilet, a camp table and a fire ring. Perfect. Being a Friday, the campsites were quiet and we had our pick. We got one close to the dunes, but farther away from the toilet area. Remember, if you come out here, the area surrounding the dunes is protected wilderness. 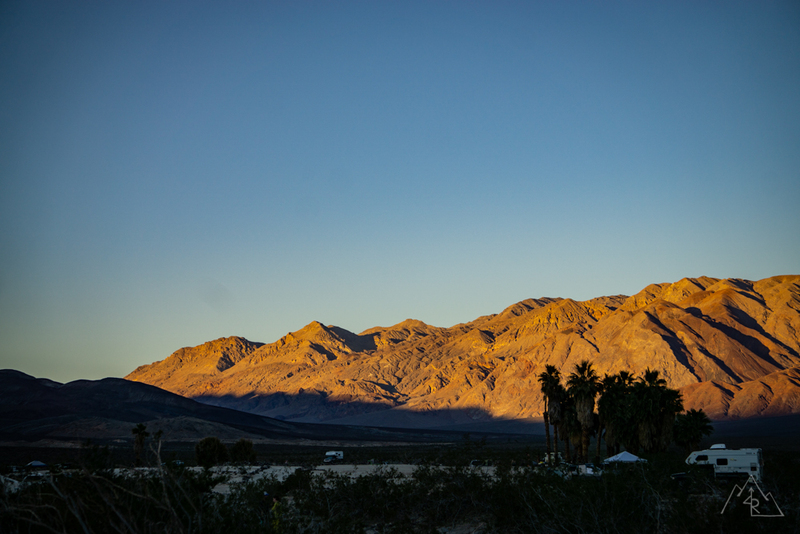 Respect the rules set by the National Park Service and stay within designated campsites. Keep places like this open for my kids and theirs to enjoy. A couple of Park Rangers came over to our campsite to set up new Wilderness Area signs outside the camp area towards the dunes, as a reminder to keep dogs and vehicles off the dunes. They were heading into Dedeckera Canyon that afternoon and through Saline Valley. They had a modified Tacoma which “goes on every trail here in the park” and a newer model F-150. It would be the first time over Steele Pass with the Ford, but it had a leveling kit and larger tires so they thought it wouldn’t be an issue. If they came back through, we would know the answer to that! We positioned the cars for later and began to set up camp when we heard a low rumble. Just as I looked up, we were getting a pass over by a local F18 Hornet, likely flying training routes from China Lake Naval Base. If you have never had a fighter jet “buzz your tower”, put it on a list of things that you need to experience in your life. The sight, sounds, and feeling that you get makes every hair on your body stand on end as you yell at the sky in excitement. Or maybe that’s just me… The moment passed with a healthy dose of adrenaline. I went back and grabbed my camera, just in case they came back for another lap. About an hour later in the middle of a conversation with Chris, I looked over his shoulder and saw that the F18 had returned. I was able to capture some photos this time as he lapped the dunes in both directions before heading south towards Saline Valley. I realized how effective these weapons are when I saw it coming towards us in near silence. It wasn’t until it was on top of us that its audible presence was known. After calming down from the excitement, Chris, Satya and I went for an afternoon hike on the dunes trying to get near the top for sunset over the valley. These dunes are BIG. You realize this as you are huffing and puffing pushing sand behind you with every step. I knew I was out of shape, but damn if that dune didn’t put me in my place. Satya was enjoying the hike by taking breaks to slide down small sections as we went along. We neared the top as the sun started to set. Chris and Satya went to a small flat section to sit and watch the sun go down. I made a b-line for the summit to catch a few photos before heading back to enjoy the last light with my friends. 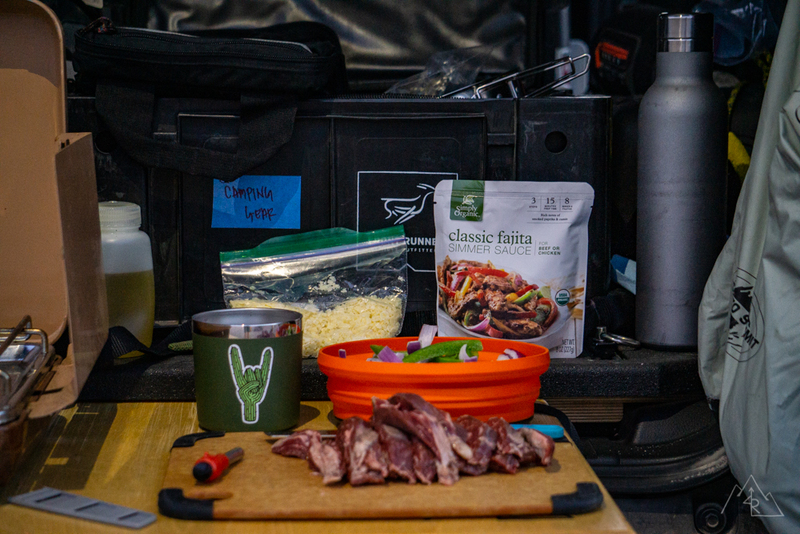 We made our way back to camp where we cooked up some well earned dinner and got a fire going before calling it a night. Beside the moon lit dunes I was happy to be back outside, outside cell range, enjoying time under the stars. Morning came after a very calm night at the dunes. Breakfast. Breakdown. Clean-up. 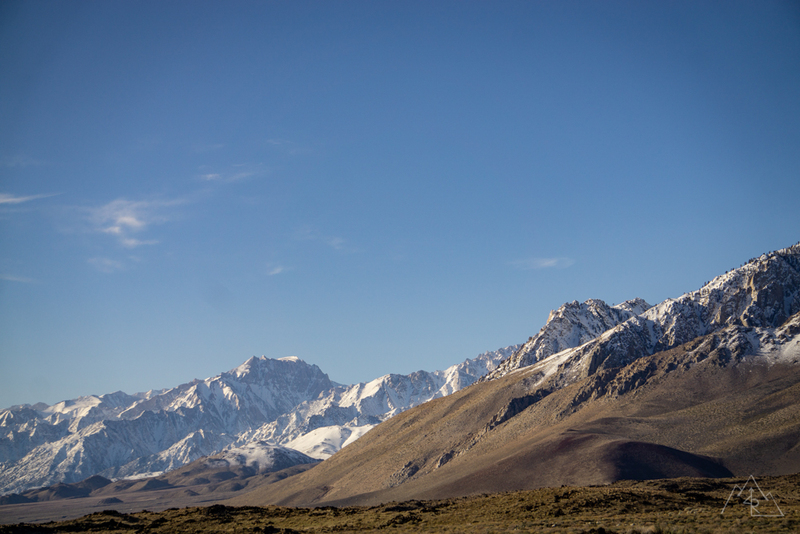 Our plan was to head over Steele Pass and into Saline Valley for the next night. Now the majority of Steele Pass is not very technical, but the section through Dedeckera Canyon has a couple of waterfall obstacles that require high clearance and some planning. This is where we weren’t sure whether or not Chris’s stock Double Cab Long Bed (DCLB) with no slider protection would be able to make it through, mostly because of the longer wheelbase. Our Ranger friends from the day before never came back through the dunes, so we knew that their full-size F-150 made it through, a good sign. I knew that lifted or armored DCLB’s have no problem through here, but his configuration left some questions on whether we would make it. This is why I checked out the conditions on North Pass earlier, so we had an alternate route if needed. Chris was game to try to get through, so we went for it! Catching one last glimpse of the dunes in the mirror we approached the entrance to the canyon and the beginning of the technical section. We got out to walk and talk through the series of small waterfalls through Dedeckera. After a quick talk, we decided to give it a go. I would go first for Chris to see the lines and he would follow. The last time I came through here, the 4Runner was running stock suspension, 275s, and sliders. I rubbed the sliders a few times on that trip, but otherwise it was doable. This time with my upgraded suspension and slightly taller Cooper Discoverer AT3 XLT 285s, the 4Runner walked through the canyon with ease. No rubbing, slipping or any sort of drama. Having been out of the off-road seat for a while, it was great to be back in 4 LO and it left me itching for more. I walked back to spot Chris coming through the waterfalls. Satya stood close by, watching her dad and acting as a co-spotter with her own radio to let him know what was going on outside the truck. Despite the long wheel base, his DCLB made slow but easy work of the trail and its challenges. A little “passenger” and “driver” prompting on comms brought him through on the right lines and he drove out without a scratch! I suspect that his lack of running boards made the difference here in the few places where clearance was tight, although he does want to add sliders on at some point for added insurance. Through the toughest part of the day’s route, we meandered through Steele Pass before beginning the descent down to the hot springs for the night. We stopped in at a small hidden landmark, the marble bathtub for a quick “soak”. Satya got in for a quick photo op! It provided a good spot for a quick lunch and trail beverage to split up the driving. Coming down to Saline Valley, the trail changes from sandy two track to more technical rocky sections that require a good line to avoid coming up high centered or receiving a sidewall slash from sharp rocks scattered throughout the landscape. With palm trees on visible, we came through the last section of wash and into the hot springs area. I led us to the area I last camped here, off to the side of the main track but still within walking distance to the Palm Springs. We parked and changed for a quick afternoon soak. We had the afternoon to relax and enjoy the warm pools and sunshine. The springs themselves weren’t crowded, and neither was the camping. We were in for another good night here, listening to the burros and laughter long into the evening. Sunrise takes on a whole new meaning when you’re in a natural hot tub overlooking the snow capped Inyo mountains to the West and the sunlight slowly creeping down until it meets the valley floor. I returned to camp to make coffee and get ready for the day. Chris and I talked in the morning about where we wanted to end up at camp for that night. We knew the farther we got that day, the less we would need to drive in the morning to get to the highway and home on Monday. As much as I hate to push miles on a trip, it was for the best considering our location at the springs and our planned route for the day. With our long day ahead of us… Breakfast. Break down. Clean-up. 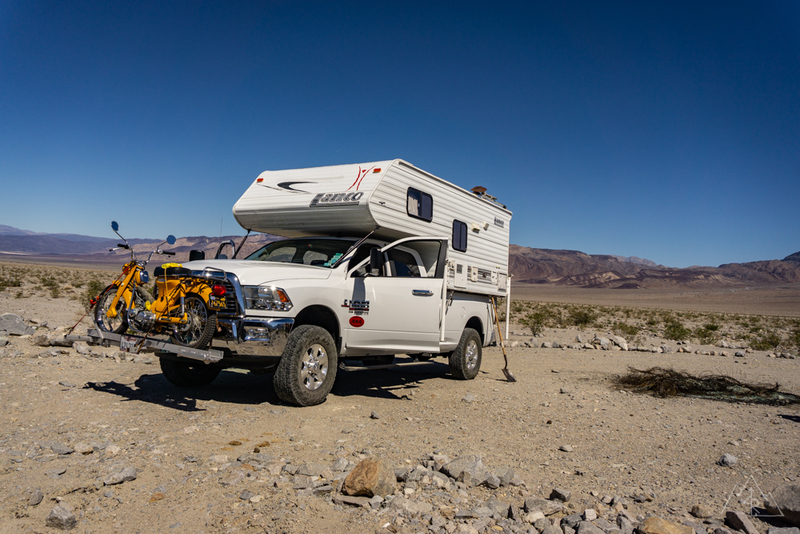 We stopped in at the lower springs for a quick bathroom break before heading out to meet Saline Valley road on the west side of the valley floor. A quick photo op at the Hot Springs sculpture gave us one last goodbye to the springs. I remembered from the last trip that SVR was notoriously washboarded, and it hadn’t changed much since the last time through. I had a few tricks up my sleeve though. King shocks and lower pressure in the tires before. It took a few minutes to find the right speed (about 40mph) but man what a difference! You could still tell it was a rough road, but I didn’t feel like I was abusing myself or the 4Runner. Chris held a slower pace in his Tacoma, but we kept in touch via comms and I stopped to let him catch up every 20 to 30 minutes or so. Coming up the south side of the valley, we stopped for a couple of full size pick-up RVs on the side of the road. They were hot springs “locals” heading in for an extended stay, stopping to clean up a mess someone had left behind. A large burned out equipment tire was between their vehicles and they had spent a good portion of their day bagging up the steel remains. They asked if we could haul some out, so we threw a couple of bags in the Taco before heading on to our turn at Lippencott Mine Road. 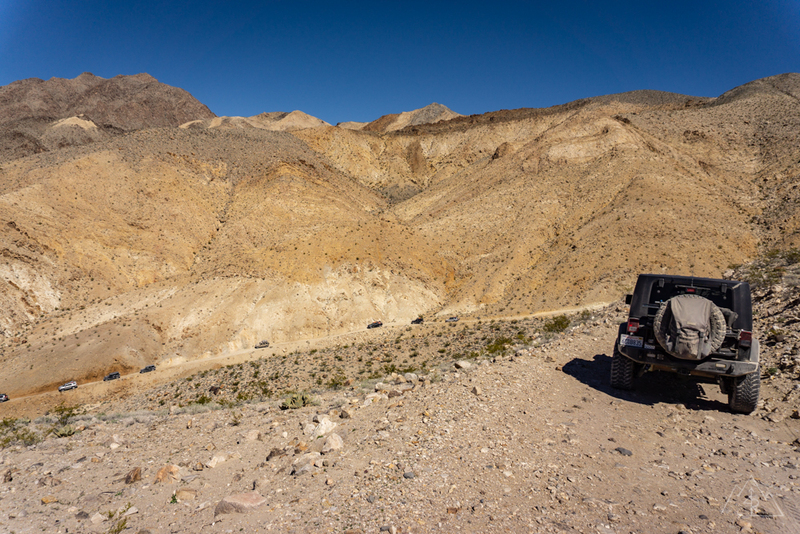 We headed towards the base of Lippencott Pass, where the road snakes up and through the mountains to Racetrack Playa. Last reports on the road showed that it was passable for high clearance 4wd with no washouts. At the base of the mountain, I called out on 146.460Hz, announcing that we were making our way up the pass. To my surprise, I got a reply from a group finishing up lunch at the summit. They told me that there were about 12 vehicles in their group and they would be coming down the mountain soon. I told them to stay in touch with us and if they could, wait at the top for us. There are areas on the road with no passing spots, especially for that large of a group. As we made our way up the pass, the road squeezes down in the main canyon with a couple of minor washouts on corners. “Hang wide”, I said on the radio as I rounded a washed out corner. Chris was following with ease in the Tacoma. There is one section on the road where a landslide had claimed part of the road. At some point, someone cleared enough off the top to drive over it, but it makes you lean at a pretty aggressive angle towards the canyon below. I am sure that I wasn’t close to the rollover point of the 4Runner, but I’d be lying if I said I wasn’t concentrating very hard. From there, Chris followed slowly over the wash, both chuckling afterwards about the condition of our seats at that point. At this point we ran into the ‘scout’ from the large group that had gone down before the main group to see where we were coming up the pass. We were in a bas spot to pass, so we opt’d to head up the hill to where I knew there was a larger clearing. Right when we were approaching the corner, the first 4wd came around the corner, then the second and third. We had to play a little trail shuffle to get people out of the way to allow us to get to the clearing, but it was eventually sorted out. In my opinion, if I was in a large group heading down a one way trail knowing that someone was coming up the same road, I would have waited for them to get to the top or to at least get to a safe passing spot and having them give the all clear to come on down. Sending a scout ahead was a smart move, but it doesn’t do much to help control traffic flow and avoid a potentially timely and dangerous situation. Had we been a few minutes slower on the trail we would have met head on in the steep and narrow portion of the trail which would have been a bear to work out. Always heed to the person/group coming up the hill. Period. 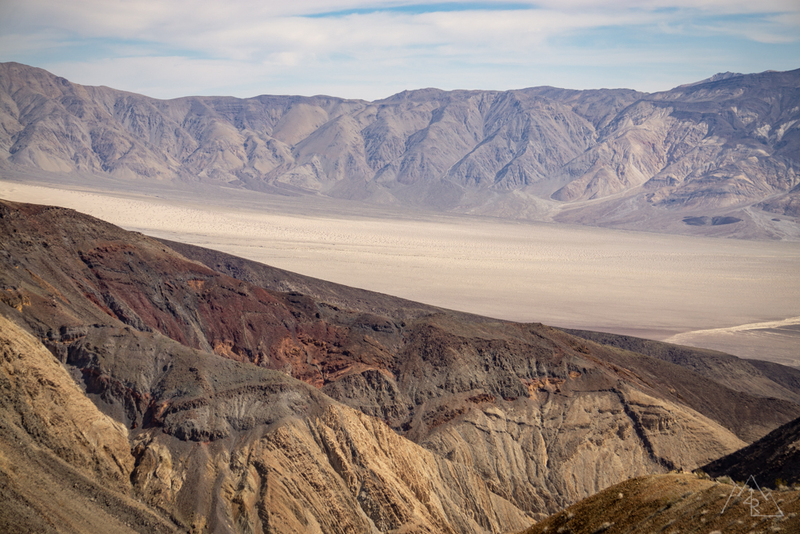 We took a few minutes at that turn out after the group passed by to enjoy the view over Saline Valley. It’s an epic view with the ability to see the far north end of the valley and North Pass. We crested the top of Lippencott and continued to the famous Racetrack Playa. Last time I was here, we stopped at the Grandstand to have lunch and explore, without seeing any of the mysterious ‘moving rocks’. We stopped at the South end of the playa to walk out and see the rocks and their moving paths! (For more info on the ‘sailing stones’ of Racetrack and the Grandstand, click here) It was really cool to see the different paths that they take, even though some rocks might be right next to each other. We agreed to stop at the Grandstand pull out for a lunch break and to check out the Grandstand. I took a look at someone’s 2wd Suburban while we were there for lunch. They said that their front end was making a bunch of noise on the way in, and after a quick inspection I couldn’t see anything immediately wrong. I just told them to slow down on the washboards and that they’ll expect to hear noises and feel clunking on roads as washed out at this. I also chatted with a couple who had just finished hiking Ubehebe Peak which overlooks both the Racetrack and Saline Valley. A future hike for another trip! My original plan was to camp somewhere within about 30 minutes of the Racetrack and continue to Ubehebe in the morning. But we wanted to get closer to 190 tonight to make an easy exit in the morning. 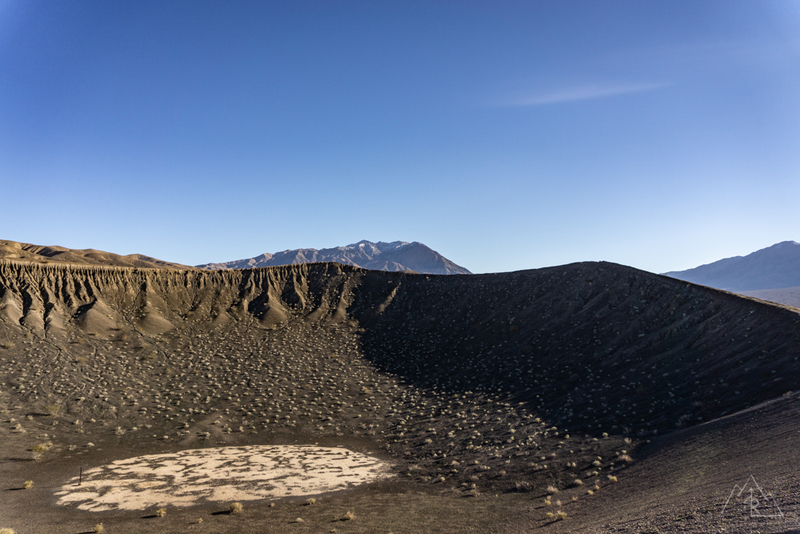 So we pushed on to the next stop, Ubehebe Crater. When I say that road was the worst washboard road I have driven down…. I mean it. Talk about a teeth rattling experience where anything between 5 and 35 miles per hour was really rough. Mind you, that’s how I feel at 18 psi, with a modified suspension 4wd. I can’t imagine what the people out at the playa felt like driving out there in their compact SUVs and full size trucks on highways tires at highway pressure felt like getting there, let alone on the way back. Never the less, we pressed on. 45 stressful minutes with a couple quick stops later, we arrived at the edge of the dirt road where it meets the pavement. Thank. God. With daylight time running low, we put together a game plan for our night. We were aiming for a nearby park service campsite that would be an easy in/out for our exit in the morning. This part of Death Valley is not very dispersed camping friendly, which was OK with us provided spots are available and the campsites aren’t one on another. When the campsite came up on the road, we were met with a “Road Closed” sign at the entrance. Bust. Our next option would be near Stovepipe Wells, 20 minutes away. We decided to air up a little for the road in, where we would decide where our final campsite would be. As soon as I got back into reception heading towards Highway 190, I checked the DVNP Facebook page for any campsite updates. Lo and behold, Cottonwood Canyon officially opened a few hours earlier and would be our target campsite just outside of town. Per park rules, you need be 8 miles from the start of the road to set up camp. With light fading, we took off up the the long fan towards the mouth of the canyon. The road starts as a fast wash, mainly sand with small back and forth curves to make you feel like a rally driver (even though you’re not going that fast). That smooth, fun bit is then suddenly interrupted by, you guessed it, washboards. With the Indeflate at the ready, I quickly hopped out to dump air from my tires to make the ride more comfortable. Chris elected to carry on at highway pressure, he passed and I would catch up in a few minutes. We passed the 8 mile mark, I turned on my Baja Designs S2 side lights to start looking for a flat spot large enough for both vehicles and Chris’s ground tent. 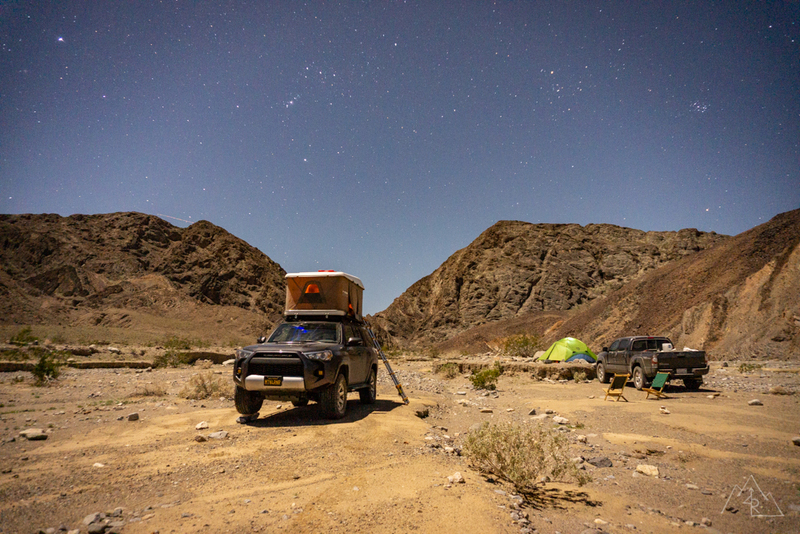 These camp lights are great for getting positioned and set up in camp after dark and it didn’t take long before we found a little raised section of the wash right next to the road to call ours for the night. With wind coming out of the canyon, it was the warmest night we spend in the desert. The change in temperature made not having a campfire for the night bearable as we sat around for a good dinner and view of the valley below us. Knowing we all had a long drive home the following day, we called it a night early and headed for the tents. We wanted to stick to our plan, which meant that we needed to get moving to stay on track. We drove back to Stovepipe Wells on the same road we came in on the previous night. The tires had lost a few extra pounds of air in the cool of the night, so the washboards I came in on felt even smoother as I motored back to the gas station at the edge of the highway. We spent a few minutes airing up our tires one last time, draining Chris’s cooler of extra water and making sure that nuts/bolts/fluids were where they needed to be after more than 160 miles of dirt time. Thanks to the Indeflate, the latter on the list we could do while the tires were airing themselves up two at a time. At highway pressure, we turned towards Lone Pine on Highway 190 towards the last Death Valley point of interest on our trip, Rainbow (Star Wars) Canyon on the west side of Panamint Valley. This lookout is famous for being a Naval aircraft flyby hotspot, and we wanted to catch a glimpse of something I had only ever seen online. Thankfully, when we pulled up, there were a number of people waiting to see the same thing we were. Pure. Hot. Speed. 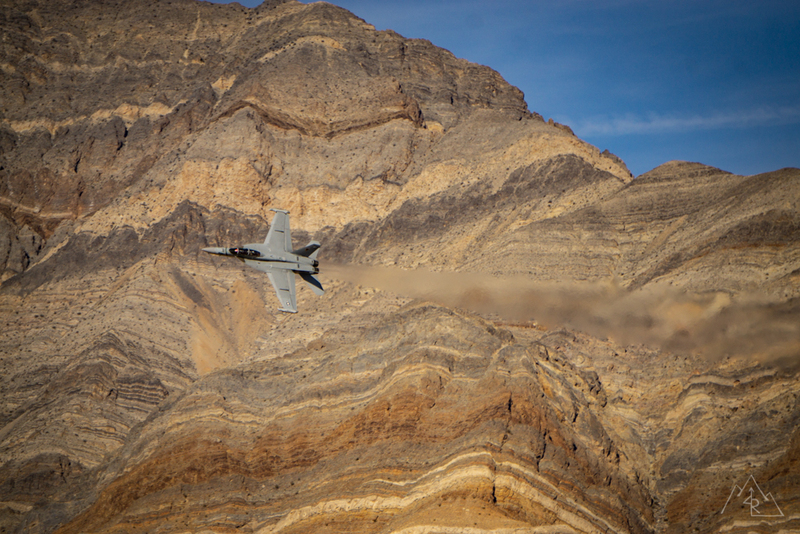 It didn’t take long before we got our first flyover from the same type of plane that buzzed us at the dunes, the F18. They come through low and fast through the canyon, and out through the valley below us. From my understanding, they do this for training purposes because the terrain simulates combat conditions in other parts of the world. Excellent! 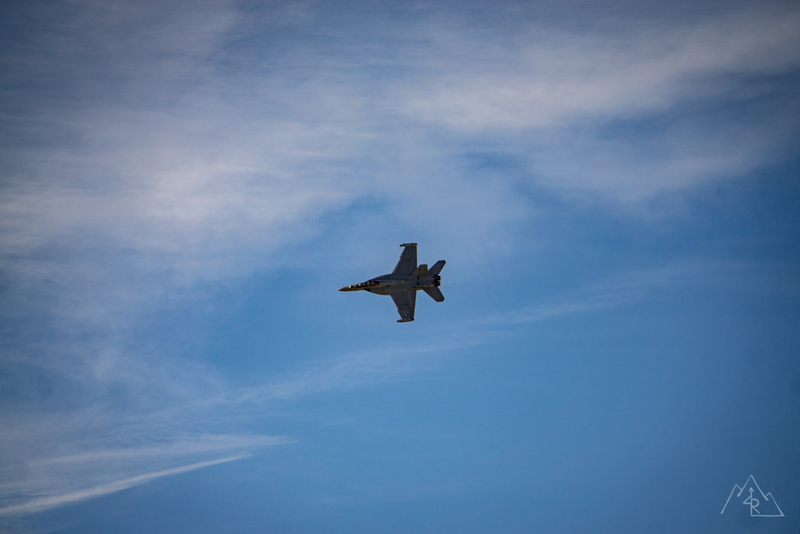 A short while later, we were treated to another flyby where I could take a few photos of the F18 as it passed below. 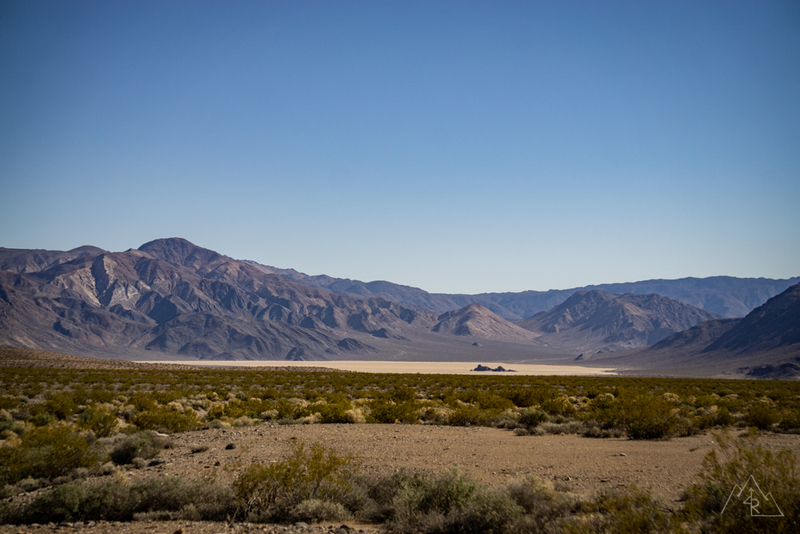 As it roared into the distance and out of sight, we too made our way back to the main highway and out to Lone Pine, our last stop before heading home. With the fuel tanks topped off and lunch at the ready, we set off for our respective homes hours to the west. This trip was the perfect spur to the 2019 camping season for me and a great way to revisit this beautiful part of California. I was happy to reconnect with a friend I hadn’t spent much time with since I graduated from college, and to gain a friendship in his daughter Satya, who had been awesome the entire trip! It’s exciting for me, not being a dad yet, seeing others with their children on these adventures that I enjoy very much. 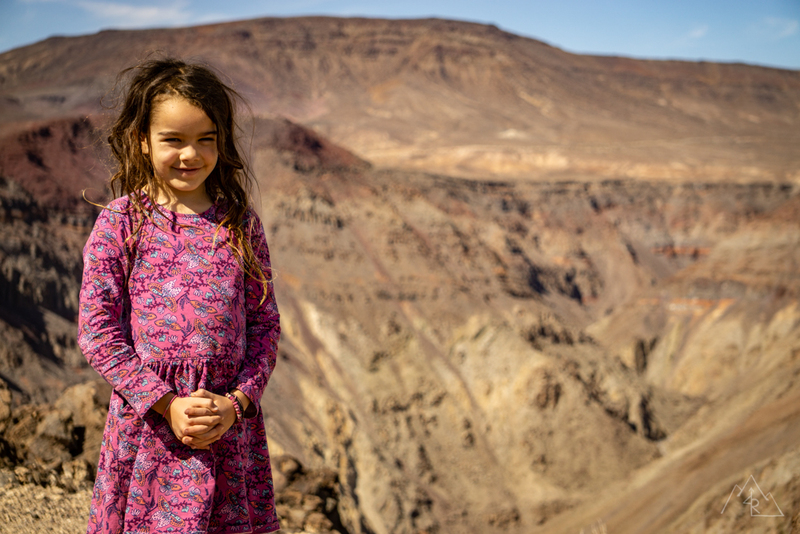 It gives me good hope for my future as a father at some point, and I was happy to spend time with Chris and his daughter on her first desert trip.